Our first exhibition for the year here at Arbeia is all about the fort defences – the walls, ditches, ramparts, gates and towers that defined the fort. During the research for it we came across old photographs of all the excavations that have been carried out on the defences over the years. 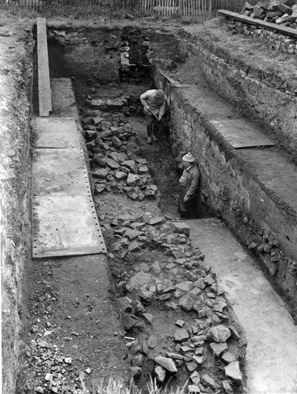 The first photograph was taken in 1961 and shows a section of one of the ditches on the east side, carried out by the South Shields Archaeological and Historical Society. 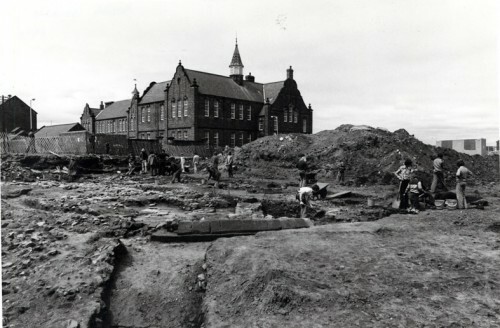 Excavating the east ditch at South Shields Roman Fort in 1961. The second photo dates from 1977 and shows the remains of the curved wall of the angle-tower at the south-east corner of the fort. Behind the area under excavation is the old Victorian school, before its demolition. Where all the excavators are digging is where the reconstructed Commanding Officer’s house stands today. Excavations in the south-east corner of South Shields Roman Fort in 1977. In the foreground is a trench leading down into the ditch. 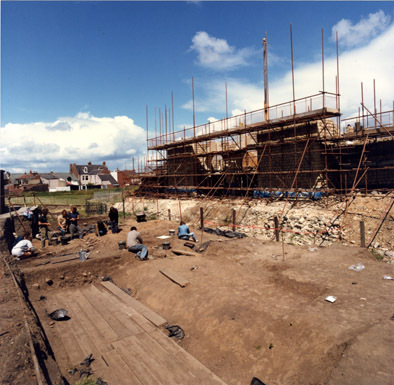 The final photograph comes from the mid-80s and shows the ditches outside the west gate under excavation … and the west gate under construction. The ditches outside the west gate at South Shields Roman Fort under excavation. Beneath all the scaffolding the reconstructed gateway takes shape. Strange to think that gateway is now over 30 years old! I remember in 1986 helping the dig as part of a history project. We helped dig for a week and I do remember it was one of the hottest weeks of the year. Know I know how the Gauls felt! Nice to bring back the memories! Great thanks to you for making us remember. And well researched on this. Keep it up and keep on sharing.